Hundreds of teams from across the nation filled Eastern Michigan's Rynearson Stadium this week for the AAU Junior Olympic Games in Ypsilanti, Michigan. 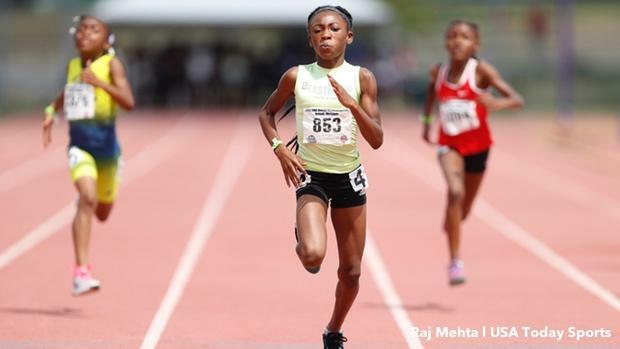 And with competition came ubiquity in familiar uniforms like Michigan's Motor City Track Club, Florida's Miami Gardens Xpress, and Missouri's Ultimate Speed Academy. But if there's one team that could rise in exposure and profile over the coming years, it's the bright neon uniforms and logo of the Beastmode Track Club. With it comes only one qualifier: The program isn't limited by any city or regional location. Formed in 2013 by a set of committed coaches in Houston, the summer club has expanded to outlets in Louisiana, Kentucky, and Georgia, along with five locations in the greater southeastern Texas area since. In ensuing years, the organization could grow to even greater numbers, adding sports like golf, volleyball, and 7-on-7 football. Led by one of its founders, Jesse Saunders, the team has strategically planned on growth in the right regions nationally. Saunders has been key in fostering good relationships with coaches and early on worked to legitimize its efforts by becoming a 501-c-3 nonprofit organization. That includes one of its newest teams in Kentucky. In 2016, Saunders met Brandon Butler, a First Sergeant with the Army stationed in Fort Knox, Kentucky. A 17-year-old veteran of the military who had a strength and conditioning background -- along with experience in high school track -- Butler had wanted to start training athletes after finding that little was available on the base for children of military families. He was at a track meet in Birmingham, Alabama, when he met Saunders. "He said he had a program and he wanted to outsource a lot of the Beastmode Track Club across the nation," Butler said. "It sounded like a blessing in disguise, but at first I thought it was too good to be true." Butler knew that in order to start a legitimate nonprofit youth track and field club, he had to be patient. But coincidence seemed to find him. Butler began to realize that by merging with Beastmode, he could help transform youth athletics on the base quicker then he imagined. "I'm a pretty good judge of character," Butler said. "At the time, the season was about to start (in March) and I wanted to train athletes. So my wife and I met Jesse and his wife. He's a good Christian gentleman. They made us feel like family and we trusted them right away." By March of 2016, Butler was hitting the ground running in Kentucky with the track cub. While standards of the club are uniform, such as the color schemes of uniforms, team shirts, hats, and shorts, Butler's coaching and training principles have been independent. He says all of the club's coaching is specific to its region. "We operate our program how we want to," said Butler, who had 11 athletes compete at the AAU Junior Olympic Games. "We wear everything the same as all the other teams." The only downside to operating out of a military base -- if you can call it that -- is the turnover of athletes in the club. Butler's club in Kentucky currently has about 60 athletes training under him, though it could be 30 by the following months. As military personnel fill their assignments, some go and some fill in their place. But Butler knows that by having a youth track club on a military base, he's providing an outlet for children. The team trains at North Hardin High in Radcliff, Kentucky. "My goal is to provide an opportunity to all kids," he said. Two such athletes on the base are Malik Blunt, 13, and Mia Griffin, 9. 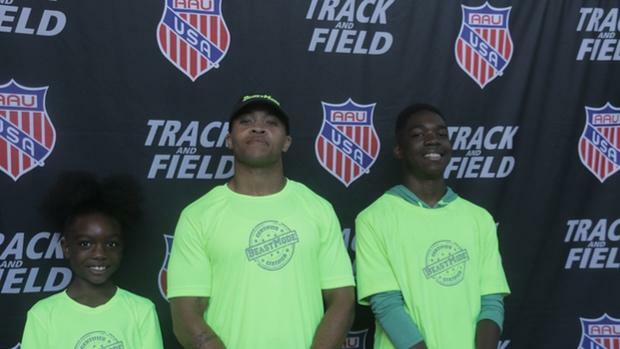 Blunt ran the 200m and 400m, while Griffin qualified for the 400m, 800m and 4x400 at the AAU Junior Olympics. "I wanted to get involved in something," Blunt said, "and this was a summer sport I thought I could do." Griffin was just starting out in sport and picked what she felt was her best option. "I guess I just I'm better at running," she said. Ultimately, the track club is an effort Butler sees continuing in the future in Kentucky. Personally, he says, he loves the name of 'Beastmode' and where it originated from. "I think the origins of Beastmode come from (Seattle Seahawks) Marshawn Lynch," he said. '"But I don't think he ever patented that." "By linking up with people who have done it for awhile, it will give us a good foundation," he said. "Our area loves it." And Butler's team may even have a champion before the club leaves Michigan. The team's 9-year-old star, Noelle Allen, is ranked No. 1 in the 100m and No. 3 in the 200m. Now seems a good enough place to start remembering the neon uniforms of Beastmode Track Club.